Give you child one of the best kids bikes and you’ll set them up for a lifetime of fun and good health. Editor’s Note: Mtbr contributor Jordan Villella contributed to this post. Kids bike have changed a lot since most adults were skidding down their parents’ driveway a few decades ago. Today’s best kids bikes are designed to help new riders develop confidence and skills, but they also come built to last and are strong enough to pass along when it’s time for a bigger bike. But what makes the best kids bikes the best? Good question. You’ve come to right place for answers. 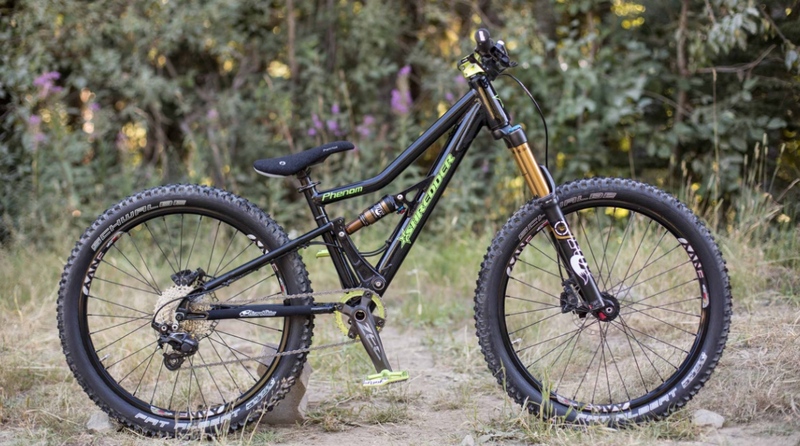 What follows are what we at Mtbr feel are among the best of what the bike industry has to offer, ranging from balance bikes to legit enduro racers. As advocates for the sport, our goal is to help create the next generation of lifelong cyclists, and there is no better way to do that than starting them off with the right gear. In this case the best kids bikes are not so different from their big kid cousins that you and I ride. Here are some of the key considerations. No matter what age you are, there is nothing like the joy of riding bikes. Yes, if a bike is too big, your child will ultimately grow into it. But that’s an inherently bad plan, as in the interim a bike that’s too big will cause myriad problems. Thus you really need to choose a bike that fits perfect now, and accept the fact that junior may be too big for it in 6 months. Most of the best kids bikes are sized based on inseam length, but make sure to check the bike maker’s website and then get accurate measurements of your little one before pulling the trigger. As complex as it is for mountain and road bikes alike, kids bike geometry is not all that different, requiring the same care and consideration. Since this may be their first or second bike, confidence and ease of handling are vital. For instance, a lower bottom bracket makes the bike more stable and easier to get on and off, while longer wheelbases make the bike less twitchy and more stable. Same goes for slack head angles. 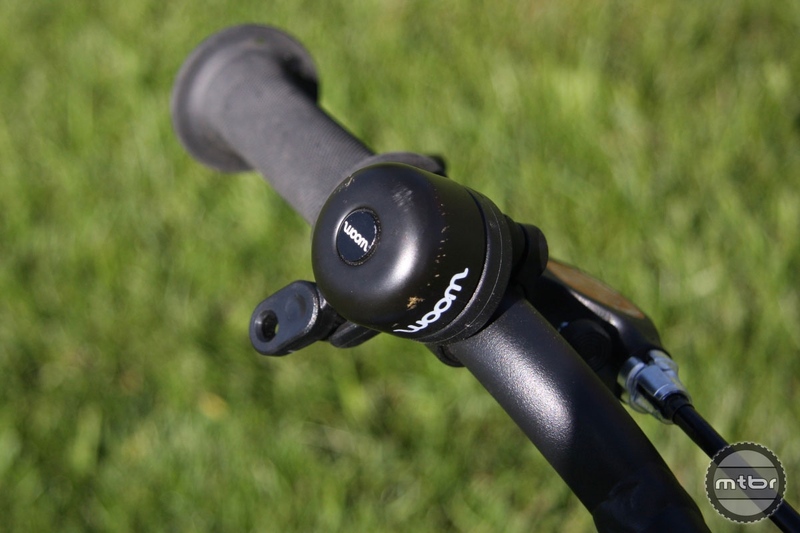 Look for bikes with thoughtful features such as the color-coded brake levers on the Woom 3, which reminds tiny tots not to grab a fist full of front brake. 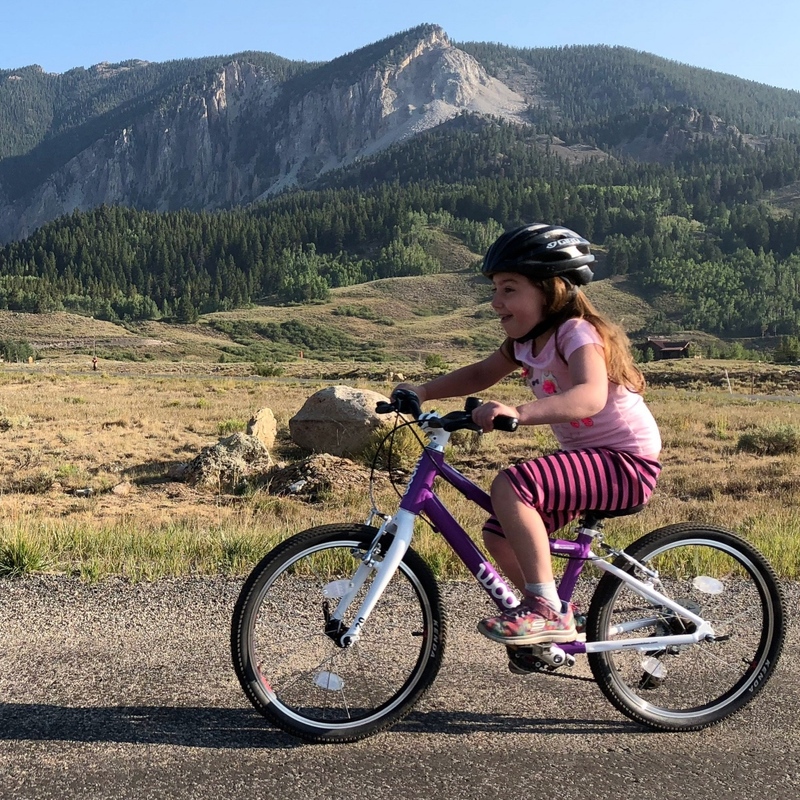 There’s obviously no need to buy your kid a carbon fiber balance bike (but you can if you want to), but bike weight is arguably the most important factor for young riders who aren’t as strong, meaning the impact of extra pounds is drastically magnified. Chances are they will be picking up and pushing this bike around over and over again, so look for a bike that doesn’t weigh as much as downhill sled. Though solid tires might sound great, promising no flats and zero maintenance, they do have significant downside in performance. 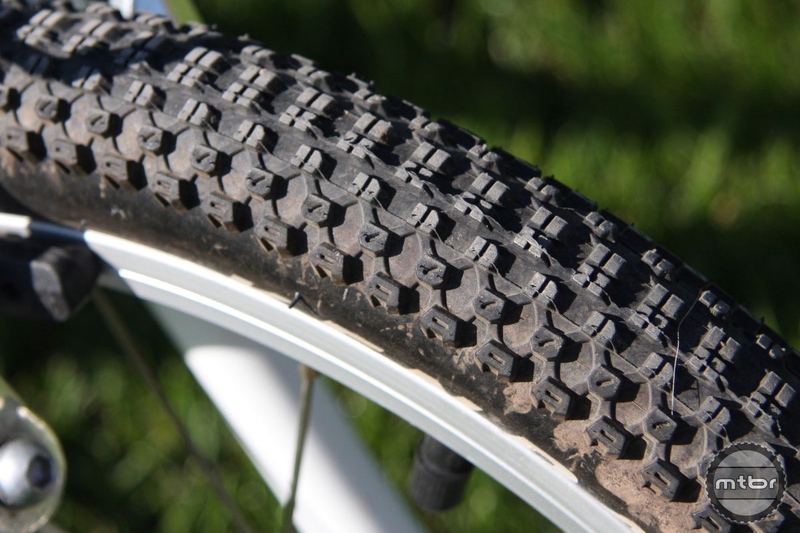 Better to opt for traditional air-filled tires, which will offer better grip and cushion when shredding singletrack. The downside is you’ll likely have to stock more tubes in your garage. But that’s a small price to pay to ensure a more enjoyable experience for your little one. Plus you can start teaching them how to change flats on their own. There is no substitute for real rubber tires with air inside. Now that we’ve covered some of the basics, it’s time to get into the best kids bikes. We’ve ordered this list in logical order, starting with balance bikes. Is your little one walking around confidently? Then it’s time to introduce them to the wonderful world of cycling with a balance bike. (That’s right skip the training wheels, please. They teach bad habits.) Conversely balance bikes do just that, teach kids how to balance on two wheels without the need for clumsy training wheels. These pedalless bike a designed without a crankset (or come with removable ones) to help kids walk freely with the bike underneath them. And most kids will start by merely walking around with the balance bike between their legs, then eventually graduate to gliding. From the company that got thousands if not millions of children rolling on their first bicycle comes this great modular option. The Strider 14x is a 2-in-1 two-wheeler that starts as balance bike and then can transform to a singlespeed pedal bike when your tiny tot is ready. 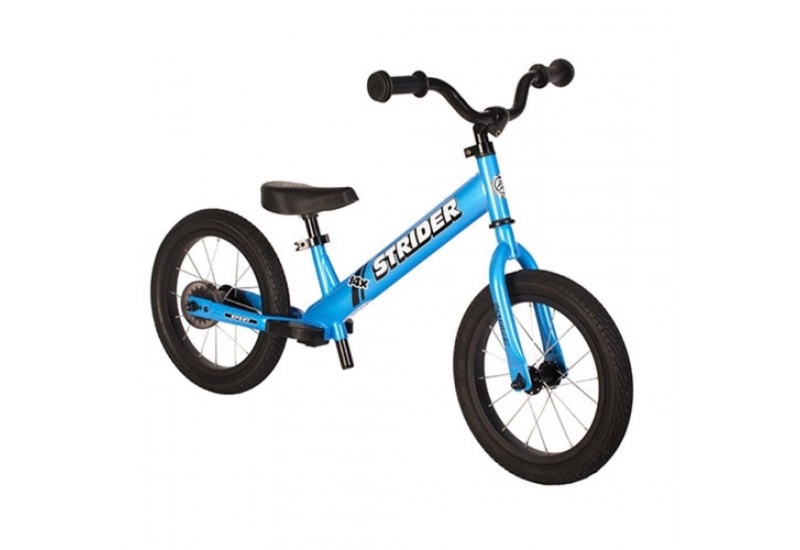 The Strider 14x is aimed at kids 3-7, has a suggested rider height of 37”-49” with an inseam range of 16”-23”. The rider height is just a guideline, explains Strider. The critical dimension is inseam. The critical feature is the bike’s modularity. Out of the box, you get an easy-to-build 14” balance bike that weighs a comparatively wispy 12.5 pounds. Saddle and handlebar height are adjustable, and there are footrests for once your child gets rolling. When balance bike mastery is achieved, simply pop off the footrests and attach the included pedal kit, a simple procedure that only takes a few minutes. Now it’s time to learn to pedal. The bike has just one speed (28t chainring up front, 16t cog in the back), and kid-friendly 76mm cranks that are easier to spin than a longer crank would be. Stopping is done via a coaster brake. And there’s even a full-length chain guard that keep pant legs protected, as well as stopping gunk and grime from building up in the drivetrain. 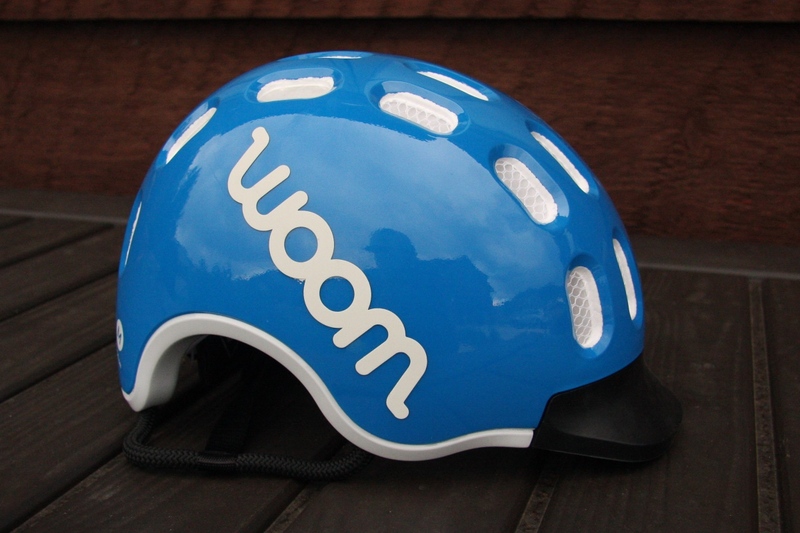 Intended for children 18 months and up, the Woom 1 is for kids just getting familiar with the world of cycling. Due to the extremely low step-through entry point and the adjustable seat length, your little one can enjoy balancing and riding as soon as they can start walking. 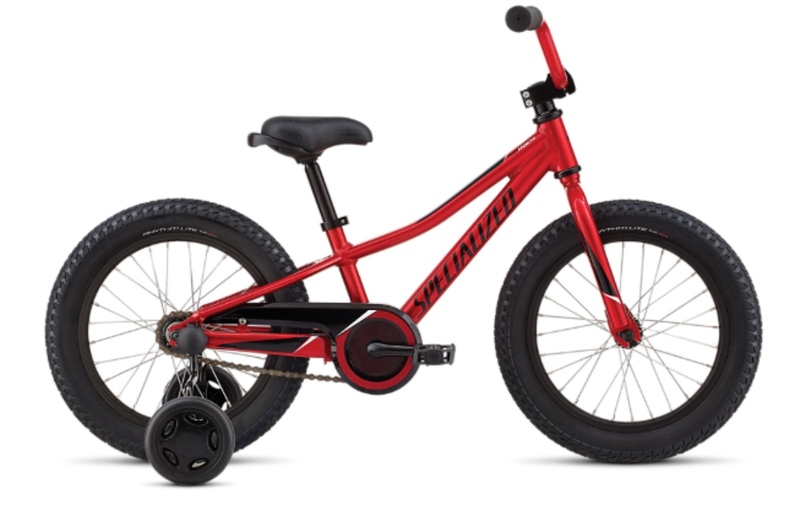 It comes with air-filled tires and a hand brake to start your kid on the right path for easy freewheel transition. 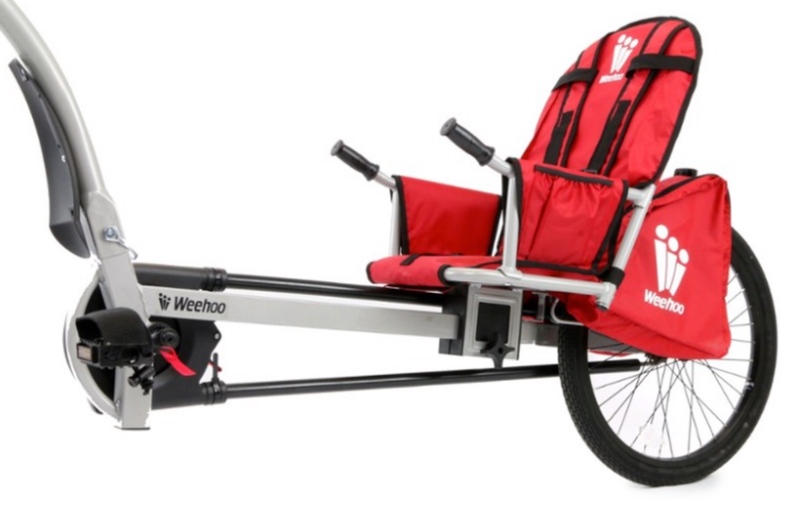 Other features include a lightweight aluminum frame components (just a touch over 7 pounds) and an upright seating position and a steering limiter for safety. It also has 12-inch WOOM-SOOPA-DOOPA-HOOPS alloy rims and industrial bearings hubs that are connected with stainless steel spokes. And it’s available is many color options. Some kids are always going to be a bit more serious about their bike riding. If your mini-cyclist likes to race, jump, and ride off road then the Cruzee Ultralite Air Balance Bike is for them. 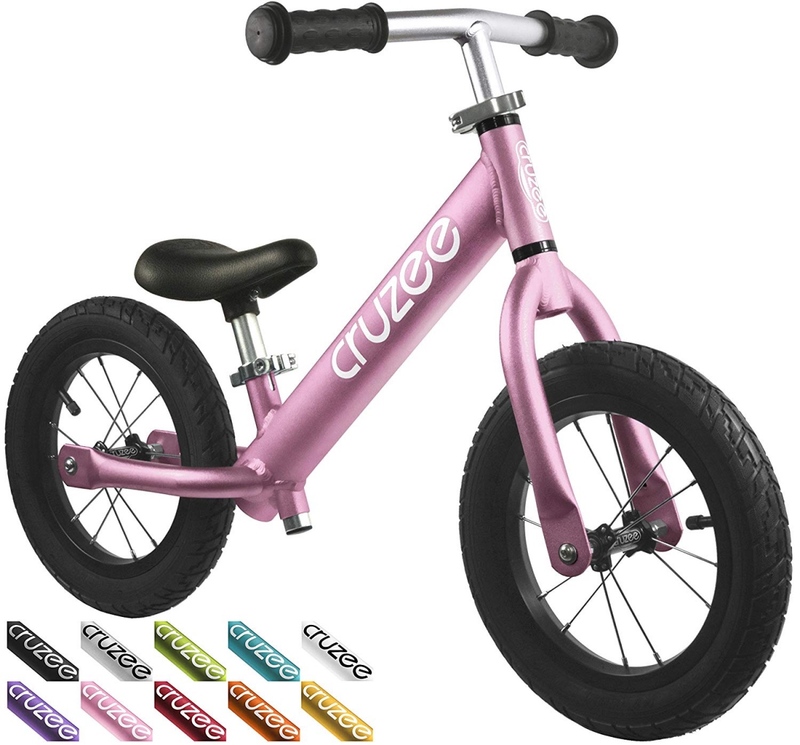 The Cruzee Ultralite Air has all the features of other balance bikes, but ships with Ultralite Air wheels. Along With the Cruzee Balance Bike frame, this combo provides strength and increased rigidity, while allowing for adjustments in tire pressure, traction, and riding comfort. These are the wheels you need for heavier children or for advanced off-road riding. The total weight is just 4.8 pounds, significantly lighter than most balance bikes. From one of the world’s most iconic bike makers comes this basic but function 2-wheel starter bike. Just like with other balance bikes, your kid learns to push with their feet while sitting and stride while balancing. Seat height and handlebar height are adjustable to grow with your child, and the durable steel frame is spec’d with air-filled tires, soft cushioned grips, and a padded seat. Assembled dimensions: 34″ long, handlebars are 20″ high at lowest point, seat is 14″ high at lowest point and 16″ at highest position, handlebar width is 16.5″. Don’t forget the helmet. We love this model from Woom. When junior is ready to graduate to pedals, here are the best kids bikes for taking that next step on the progression to becoming a lifelong two-wheeled adventurer. The Ninja 14 is one of Norco’s smallest freewheel bikes, equipped with a rear hand and coaster brake as well as training wheels for the little ones who are ready for a big kid bike. 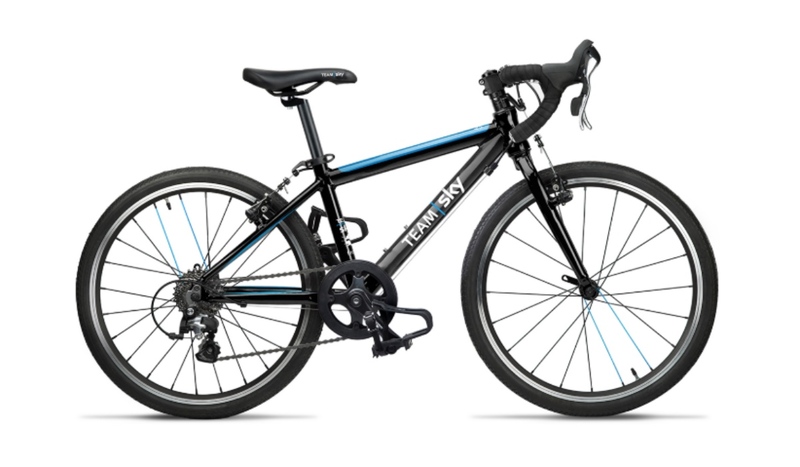 Its lightweight aluminum frame makes learning to pedal easy, and the quality construction ensures you’ll be able to hand this hot rod down from tot to tot. Plus, the comfortable seat, 14-inch grippy tires, and kid-approved paint job make the Ninja great fun to learn on. Yes the sight of training wheels hurts our eyes, too. 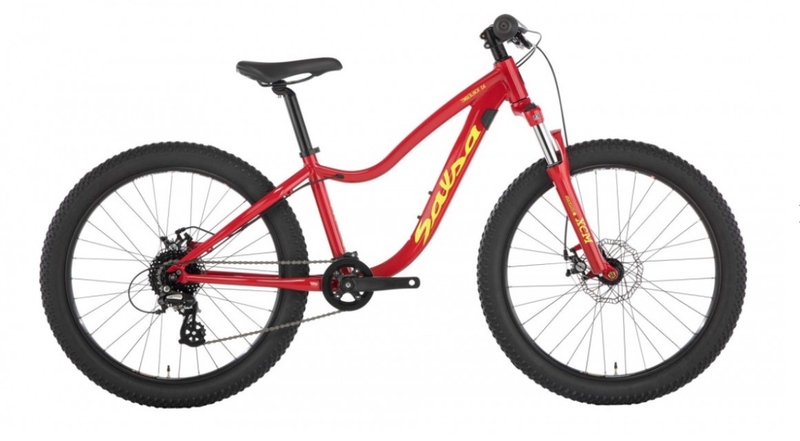 But if you bleed Specialized red, look no further for your kid’s next ride. The Riprock Coaster 16 is designed for teaching and progression, with a slight lean toward off-road adventures. Equipped with a coaster brake for simple stopping, 16×2.3 air-filled tires, and components that will stand up to years of abuse. It also comes in a bunch of fun color options, which is always critical when buying the best kids bikes. And yes, you can take the training wheels off. Look for bikes that have components made by respected manufacturers. After adding pedals the next logical progression is gears. This will make it easier for your little one to tackle small climbs and get on the gas going downhill. Yes we love this Austrian brand with U.S. headquarters in Austin, Texas. The Woom 4 is a great introduction to gears, the SRAM X4 8-speed expanding the possibilities for little Johnny. Whether they are out adventuring in an area with hills or going on a long commute in town, this 20″ bike is as powerful as the growing child demands it to be. Assembly is a snap and all tools and easy-to-follow instructions are included. 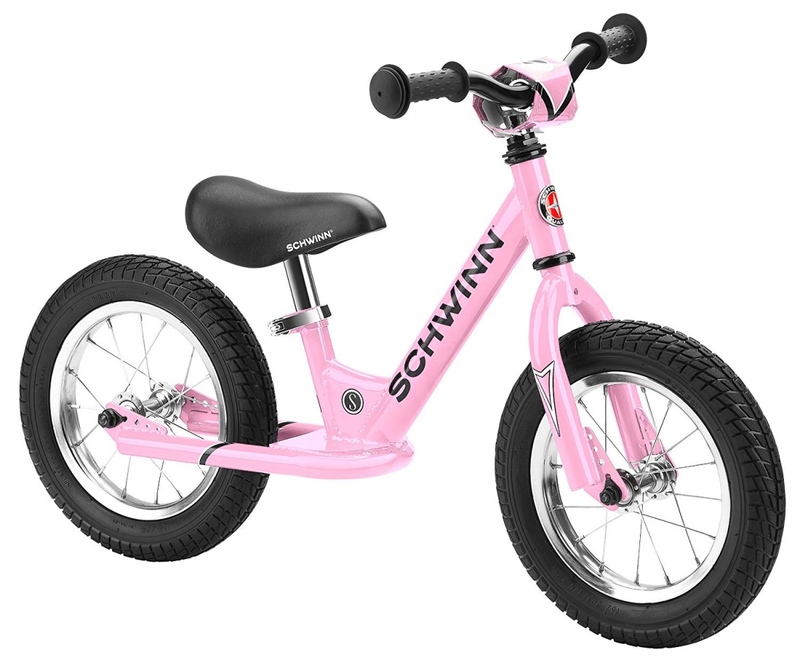 Bike weight is a reasonable 16.9 pounds and it’s designed for ages 6 to 9 years or kids 45″-51” tall. Kenda off-road tires are perfect for exploring the road less traveled. 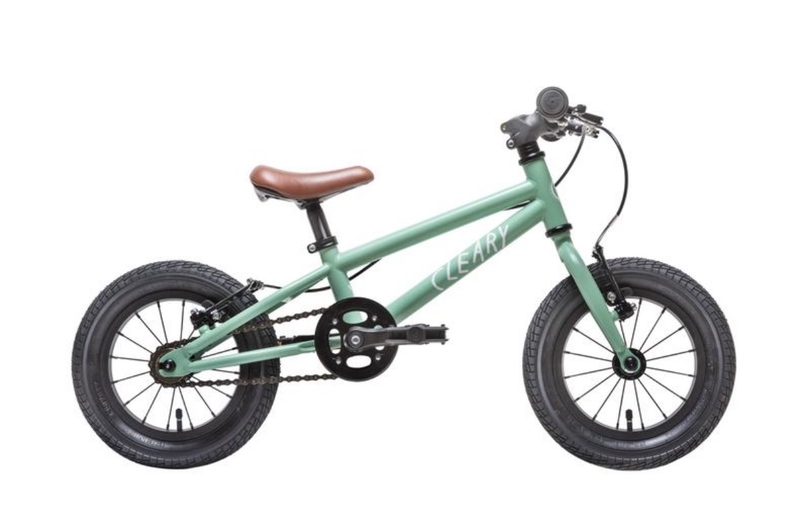 Watch their confidence and coordination improve as your kid masters gears with the Cleary Bikes Owl 20” 3-Speed. 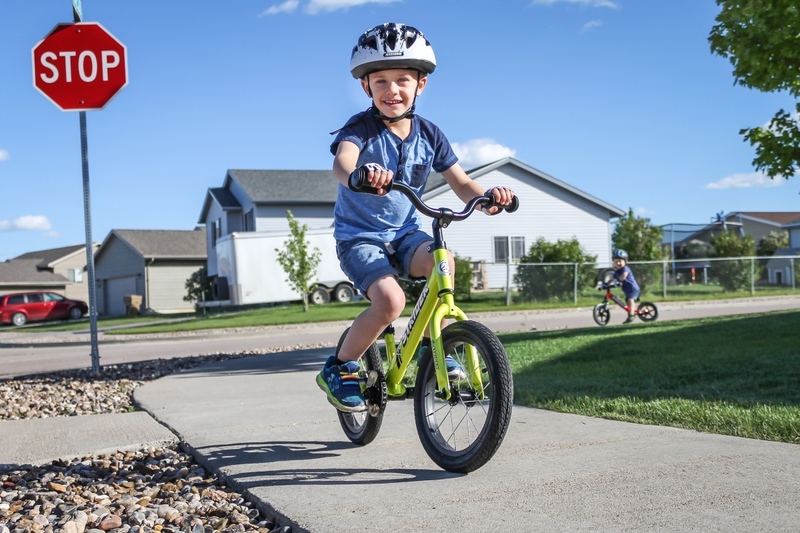 Lightweight construction and reliable components create a bike that’s ready to guide your little shredder around the neighborhood, bike path, and trails as they explore on two wheels. The Owl frame is built to withstand anything your kid can dish out, and its geometry is optimized to position smaller riders between the bar and the saddle creating a bike that ideally responds to steering inputs while remaining stable. A reinforced steel fork adds durability without the weight. Cleary wisely chooses a 3-speed internal gear rear hub to perform shifting duties. First, there isn’t a derailleur to bend or break. Second, there are only three gears so it isn’t overwhelming and they can shift without pedaling. It’s a feature we’re sure young riders will appreciate as they learn the ropes of riding with gears. Best fits young adventurers with an inseam measurement between 19” to 23”. Big tires, big fun. 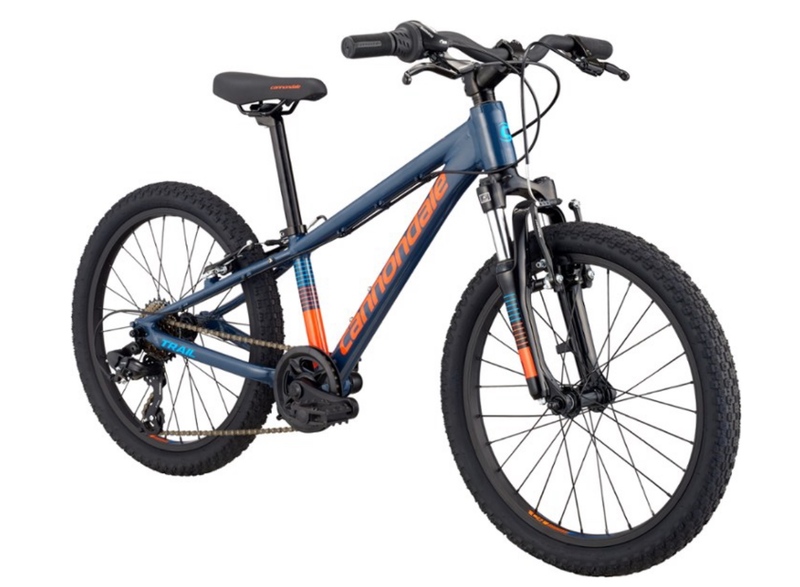 This junior-sized mountain bike has loads of traction and stability, giving younger riders confidence to improve their skills and have more fun riding off road. The Xtc Jr 24+ is designed to give young riders more confidence and control. Featuring a lightweight Giant’s ALUXX aluminum frame with a low stand-over height and geometry designed for smaller bodies, it has stable handling to help ride tricky sections of trail. Its specially sized, smaller diameter 24-inch wheels come with extra-wide 2.8” tires, which add comfort and traction. The soft, cushy tires can be ridden with lower air pressure, giving the bike a smooth ride on rocky, bumpy trails. It also features a lightweight, easy-to-use 1×9 drivetrain, powerful disc brakes, and youth-sized components for added comfort and control. 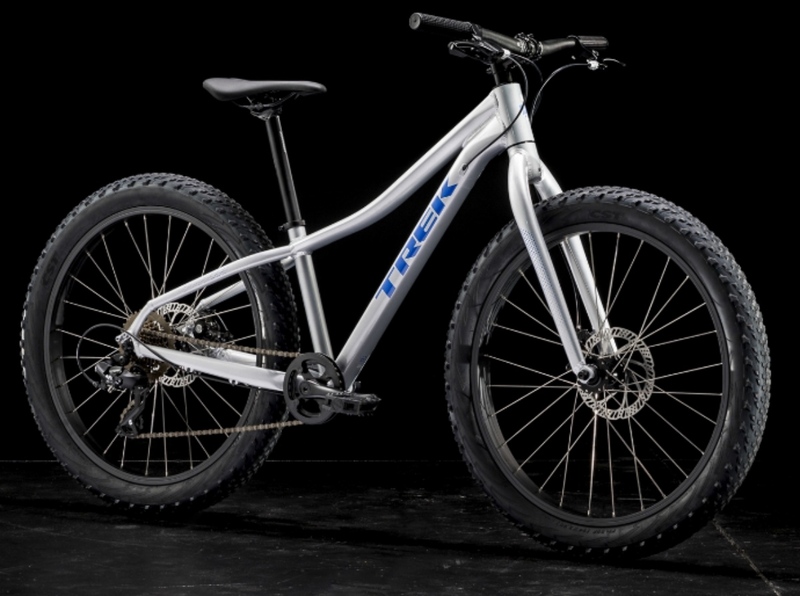 The Trek Roscoe 24 is a mid-fat kids mountain bike designed to build confidence on the trail. Taking cues from the adult Roscoe, this pint-sized ripper can take up to 2.8 tires, has a 1x drivetrain, and a wide-range cassette for easier climbing. Perfect for building skills and having a ridiculous amount of fun keeping up with Mom, Dad, or an older sibling, the Trek Roscoe 24 fits riders 50-63˝tall. 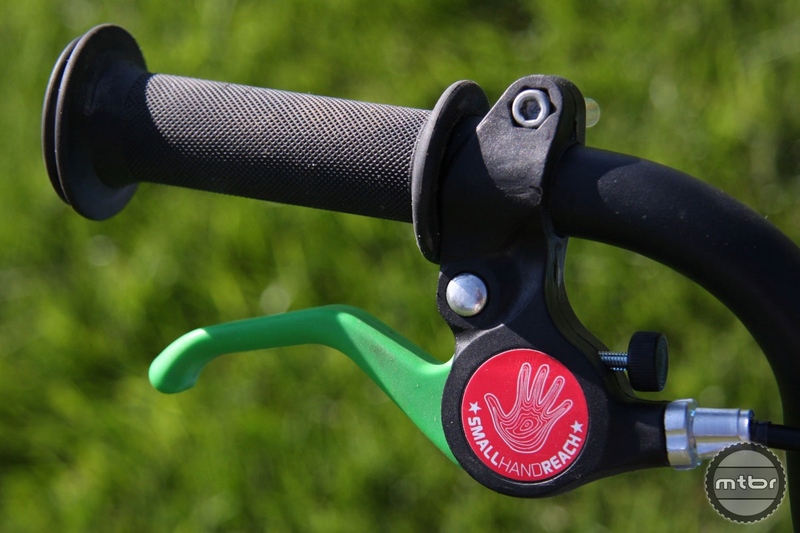 Kids bikes are a great place for SRAM GripShift. When your junior shred-head is ready to tackle some legitimate trail, best outfit them with a bike that’s just as capable as they are. And that means adding some suspension to the equation. Direct-to-consumer kids bike brand Trailcraft Cycles Blue Sky 20 is a 20” kids bike that’s designed for little rippers 5-8 years old, or about 3’8” to 4’2” tall. 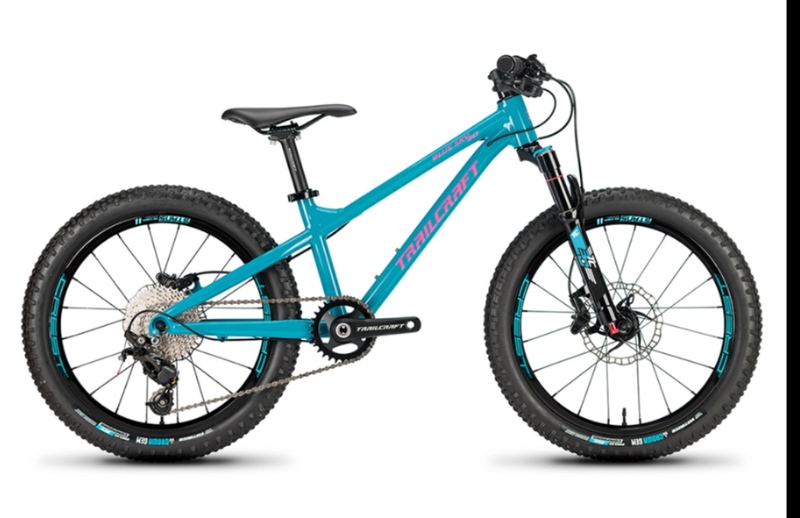 Focused on keeping weight low, the Trailcraft Cycles Blue Sky 20 will take budding young riders to the next level on mountain bike trails thanks to premium level components found on adult level bikes. Internal cable routing keep little riders snag-free and the 7005 series aluminum tubing frame features modern geometry. All Trailcraft Cycles Blue Sky 20 bikes are assembled in Fort Collins, Colorado. This means you get to configure the bike you want in three color options, two build level options, and two chainring size options to best suit your local terrain. Full custom is also possible for parents wanting to go beyond our stock level builds. Premium adult-level components shrunk down to kid size helps keep weight low and performance high. Trailcraft’s own TC30 suspension fork features carbon/alloy lowers, 80mm of travel, cartridge air damper, and low 1400-gram weight. Trailcraft’s 127mm direct mount cranks with alloy spindle, narrow-wide style chainring in 28 or 30 tooth size is another feature which helps keep weight low. Bigger wheels, bigger travel, bigger progression. The Lil Shredder Phenom allows your child to take his or her riding to the next level. Built atop 24″ wheels, the Phenom is made for kids 51″ to 63”. It can slay singletrack or bomb gnarly downhill with ease. And make no mistake this is a real mountain bike with real components so don’t be thrown off by the heftier price point. Also know that building a bike can be a very personal experience, and because of that, Lil Shredder wants to ensure they discuss the details (parts, size, color, etc.) with you before you buy. Available in Carbon Black or Sky White. Custom colors are also available for an extra $100. The Salsa Timberjack 24 Sus is a front-suspended plus-sized kids shredder designed to encourage rides that will make young explorers into lifelong ones. The durable aluminum frame is equipped with a Suntour XCM suspension fork to handle bumps and obstacles on the trail, while 24×3” wide tires help riders stay upright with maximum stability and traction. The Timberjack 24 Sus will be there on family camp adventures and solo missions in the nearby woods, fostering independence all the way. 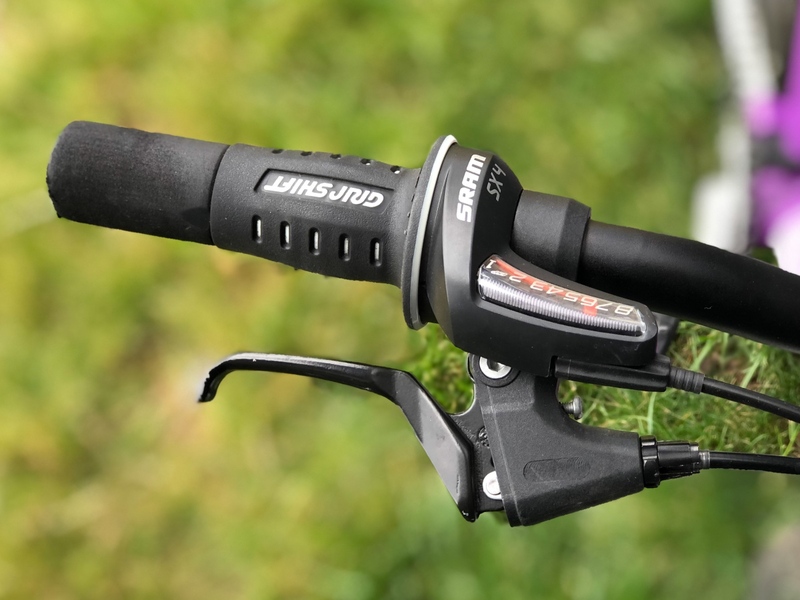 Shimano Revo Twist shifters for smooth shifting between 7 gears, and multi-surface 20×1.95 tires that can handle pavement or trail riding. Claimed weight is just under 25 pounds. Kids love bells — and it’s a great way to start them down the path of proper trail etiquette. If your kids are more into Le Tour de France than Red Bull Rampage, perhaps a road bike makes more sense than a suspension mountain bike. If that’s the case there are plenty of good options. Frog is known for producing some of the best kids bikes around, especially in the skinny tire realm. Those familiar with Team Sky and Chris Froome will recognize this bike as the one the multi-time Tour de France winner’s son rides. 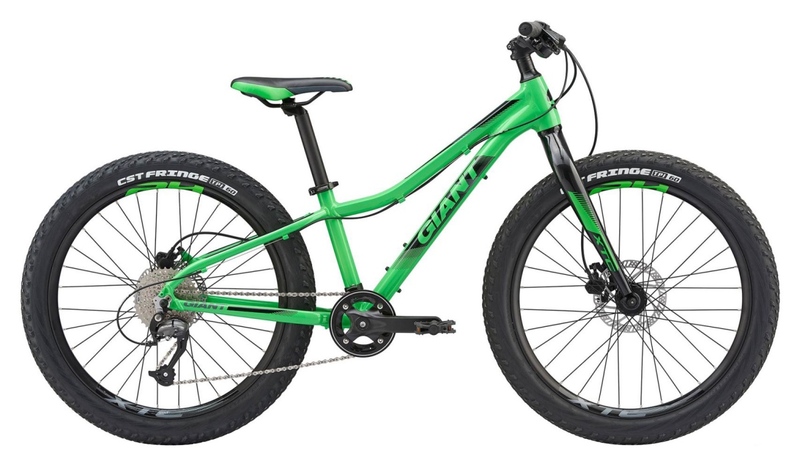 The Frog Road 58 is a 20” kids road bike best suited for riders 6-7 years old. 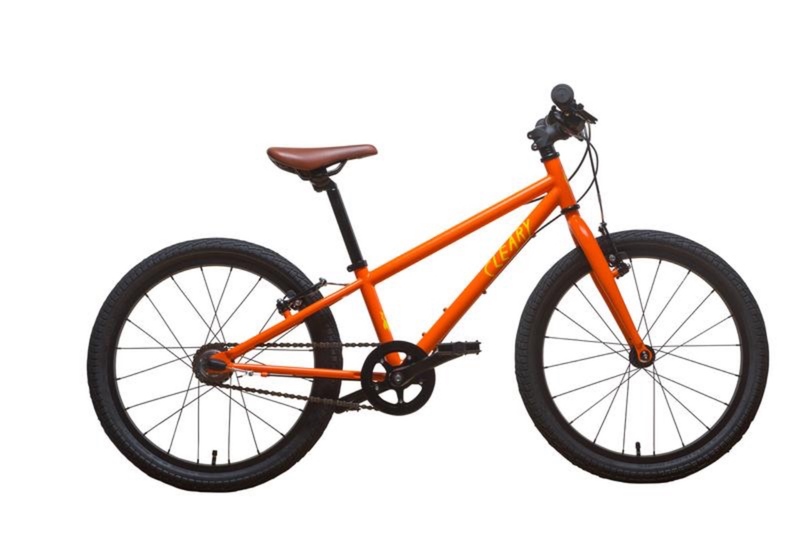 Highlights include 20″ inch wheels, narrow and short-drop child-specific handlebars, 9-speed drivetrain with Microshift short-reach brake levers and auxiliary brake levers for added confidence. The patented short 114mm Frog cranks help get the road machine rolling at max speed, and the bike has a quick release seat post collar for easy height adjustment. The Frog Road 58 also comes with a five-year warranty on frame and fork. 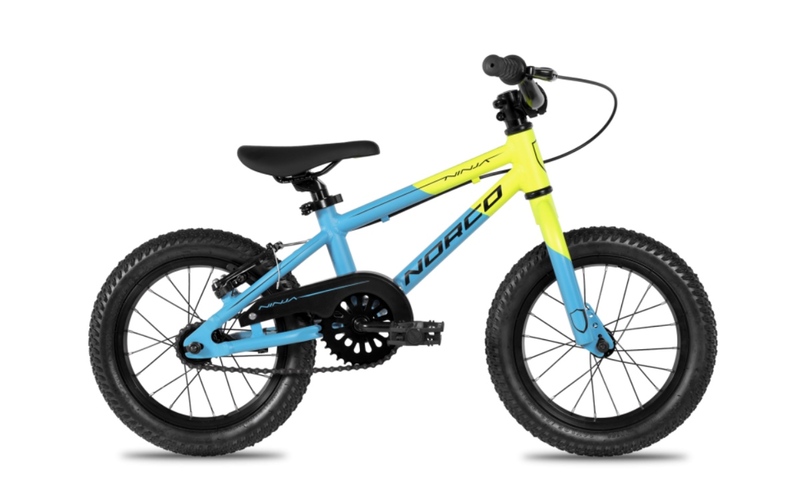 When your kid is ready to tackle longer rides and bigger hills, the Norco Valence can help. 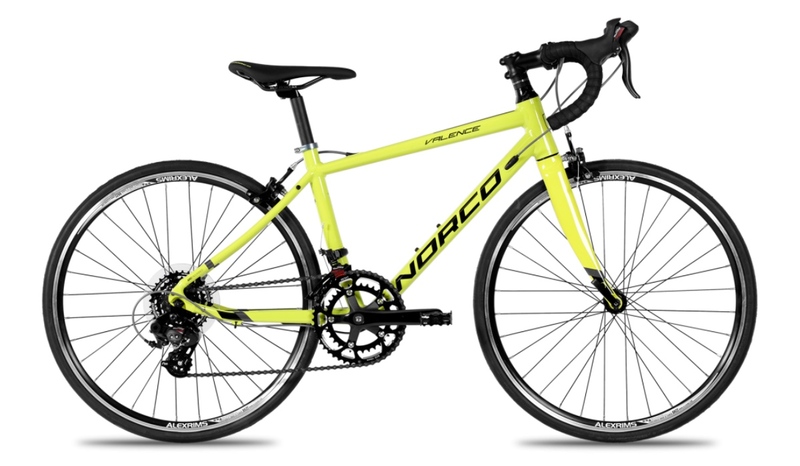 Norco designed the Valence with the same technology as their adult bikes, featuring a carbon fork and ARC technology to help dampen road vibrations while delivering a stiff pedaling platform for punchy accelerations. Realize your little rider’s dreams by providing them with enhanced endurance geometry to help them build confidence and control at high speeds to get them stoked to get out and go fast more often. And if your kid is not quite ready for his or her own bike, or if you just want to bring junior along on a longer ride, they can still experience engaging, active two-wheel adventures with the Weehoo iGo Turbo Bike Trailer. Kids pedal along is the back. And it’s safe, interactive, easy to install, and all terrain capable. No love for the Commencal Meta HT20? That’s what I got for my 8-year old and he loves it. Good article with great pointers. However, personally I’m not that big on the hype around the Strider bikes. I had my twins on balance bikes since they were 18 months. One of the bikes was Strider. Second one was Chillafish (gotta love the name) from Costco. While completely made of plastic, the Costco bike had a better geo, more comfortable seat, and inflatable tires, which greatly improve the ride quality. Strider was never my kid’s favorite. As a matter of fact, I had to get a seat cushion because the narrow, hard-plastic Strider seat (paired with hard tires) would hurt their bottoms to the point they would refuse to use the bike. Anyways, the kids switched to 20″ and while the choice was not easy, I went with Norco Shred – which I’m surprised was not featured in this article. The bike is well build and very capable. 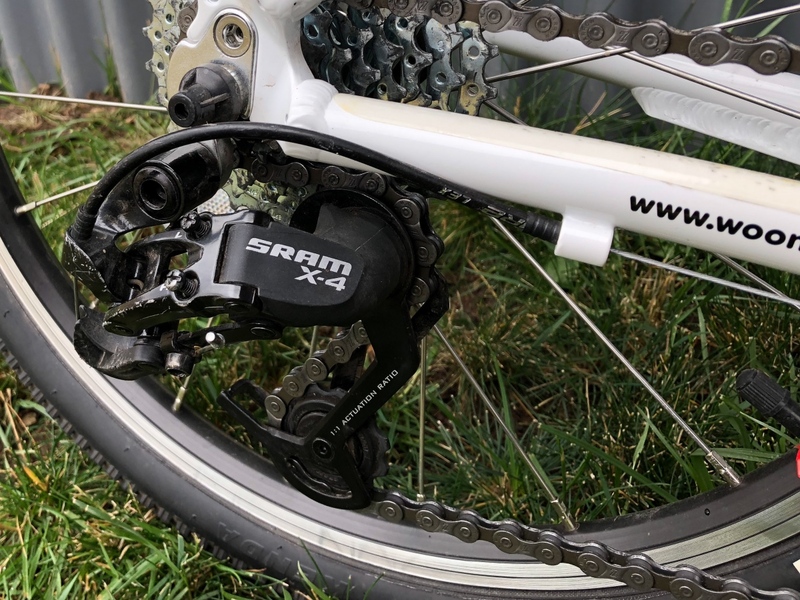 With a 6-speed rear derailleur, disc brakes (front+rear) and front suspension it appears to be a very good choice if you are looking to upgrade. A super cool bike is nice and all but the number one thing to having your kid love the sport is to slow down and take time with them at their speed on whatever bike you’ve got. It took me two or three years of packing trail snacks and hiding toys on the trail the night before to get my girls to finally fall in love with biking. Sometimes it’s great, fast and fun and other times we are riding slow and hearing about their challenges. Either way biking is great and since it all adds up, you can’t go wrong. Start them early and give them lots of strokes. Same goes for my wife.